The Certified Angus Beef® Program was formed in 1978 to provide assurances of beef quality and flavor to consumers, who during the 1970’s were largely dissatisfied with beef quality. It was a venture that strengthened relationships between the American Angus Association, beef producers, packers and distributors. Generations of America’s farmers and ranchers do the selecting, raising and feeding so their licensed restaurant and grocery store partners can offer the very best Angus beef available. You will taste the difference – and so will your family! Not all Angus is equal. Other labels may say Angus, but that’s where the similarities end. The difference is in the flavor. And that’s where Certified Angus Beef® brand sets the bar. Beef must pass 10 stringent quality specifications to earn the brand’s premium mark, ensuring you always enjoy flavorful, tender, juicy cuts of beef. Every pound of Certified Angus Beef® product is tracked for assured product integrity. 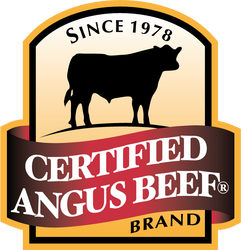 The Certified Angus Beef® brand – truly Angus beef at its best. We are proud to offer Certified Angus Beef®.